This is perfect for a birthday for all ages. Take the kids and their scooters on board and let them discover the island while you have a wine or a coffee as there are 2 bars and a cafe. You can learn about the islands convict history or check out the Islands camping facilities for an overnight stay in the future. The famous Island bar cabana has the best woodfire pizza and kids are welcome prior 12pm - 3pm. They make a good cocktail here as well and the young at heart float in for a few drinks with friends on the weekends. One of Sydney's best kept secrets. Boat parking cost $15 for 4 hrs which you can pay at the cafe on arrival, no need to pre-book. After exploring the cockatoo island pop back on board and find a secluded, quiet beach up the start of the lane cove river for a swim or have a fish in some calm water. You may just want to cruise around the harbour foreshore checking out some of Sydney magnificent mansions while having some champagne and hors d'oeuvres and make your way back to the mooring. This trip can be done in a 4 hr time period in the middle time slot. Imagine cruising over to the north side of the North Sydney side of the harbour on the western side of the bridge taking a picnic or a BBQ lunch along to later set up on the beach next to the world famous Taronga zoo check out the Luna Park and the Opera House. I recommend a stop off for the big kids on the way at Sawmill Reserve where they can go on a small bush adventure and jump into the harbour off a jetty while you can kick back off shore with some drinks and some music from your iPhone using the Bluetooth sound system on board having some adult time with few good friends while watching the adventures from the boat. Then collect the crew from the Jetty and cruise along the north foreshore past Luna park under the bridge until you get just outside the prime minister Sydney residents Kirribilli House avoiding the circular quay and harbour ferry traffic. Then when it's safe and the water is calm, cross over to Mrs Macquarie's chair back along the famous farm cove in the protected waters of the Botanical Gardens to get the best photos of the opera house and the harbour bridge. There are plenty of fish in sydney harbour and you don't have to travel far to hook up. If you plan to catch and release which is best for the west side of the bridge due to stainability and possible contamination issues. We recommend you to pull into the fish markets for a feed or buy some fish to take home. This makes a great day out.The smaller 4m savage is required to stay on the west side of the harbour however if you want to take the Pontoon over to the east you catch your own dinner see the recommended dioxin levels (click here).
. To purchase a fishing license you can buy from $7 a day online (click here). If caught without a License we believe the fine is $75 on the spot so you have to carry your receipt to avoid this if questioned. Heading East of the harbour which will take while to get to and will be the outer limit you can take the hire boat as the boat must remain inside smooth water area. Some good fishing density is reported around chowder and shark bay which is perfect. You will have to provide your own licenses and children under 18 are not required to have one and a adult can assist a minor without a license as long as the minor has 1 rod. more about exemption (click Here.) . 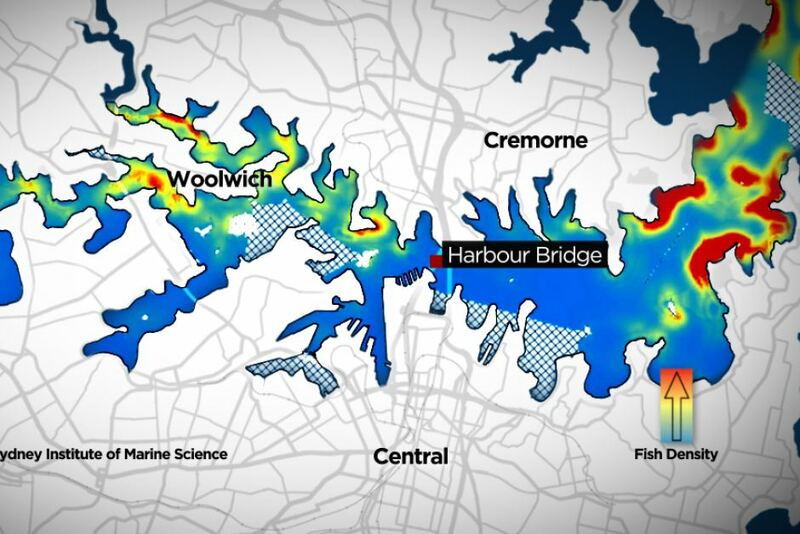 Map of hotspots on Sydney Harbour shows people catch fish west of the Sydney Harbour Bridge.http://www.abc.net.au/news/2014-08-15/map-of-fishing-spots-on-sydney-harbour/5675092Some good fishing density is reported around chowder and shark bay which is perfect. Waterside Boat Birthing Restaurant Dining. With easy boat berthing and mooring. One of the best kept secrets is fisherman's wharf seafood Yum Cha upstairs of the sydney fish market. You could of been to the fish markets 2o time and not know it was there. Quick & fast service the yum cha is seafood oriented and nice and fresh. Also book restaurants for best tables check reviews as some restaurants are tourist traps for the unaware. We love the japanese restaurant Umi Sushi especially. The soft shell crab rolls and aburi scallop sushi is as good as it gets. Its further down in the darling quarter 2 min walk from the birth. It is reasonably priced, fast & fresh with plenty of room. Try the hot saki on a cool day the kids can play in the water park while you complete your meal and then jump back on board for a afternoon cruise around the harbour icons. If you on a budget or young at heart and love a bustling pub you can do the watson bay hotel beer garden or the doyles takeaway fish shop on the wharf and cruise back to the mooring via the most expensive real estate in the country.This is a real sydney dinner and cruise should be and the one local boat owners will do. Doyal's Watson bay Book well in advance. If you on a budget or young at heart and love a bustling pub you can do the watson bay hotel beer garden or the doyles takeaway fish shop on the wharf and cruise back to the mooring via the most expensive real estate in the country.This is a real sydney dinner and cruise. Chasing good coffee is what we live for here at SCBH and getting a good one is paramount to a day out boating. Close by you can get your first port of call at Blackwattleattle bay cafe which has a public pontoon which is easy to pull into and serves The Little Marionette coffee which is a inner west local favorite boutique roster. Or you can head off to the fish markets for a Toby estate at the fish market deli or at the airstream cafe on cockatoo island. On the northside you can find Thelma & louise at neutral bay who isnt that child friendly. In for a long trip you can go to Clifton gardens Bacino Kiosk and pull up just off the beach. this is the furthest limit in smooth water boat hire on the harbour and is a hidden gem. You do get some swell rolling through so only adventure out on a smooth day. Submit quote request now for availability. Parsley bay is a secret sydney hidden gem great for the little kids to have a paddle as it has a long flat beach bar with a net around so you will have to park well back from the net and drop off at the pier. The kids jump of the pier here in the summer. you could anchor off and swim over the net or walk a picnic in for the day from the bear there is kiosk her and toilets, a children’s playground and the net is only in place in summer, Dogs are allowed on this beach. Shark Beach Vaucluse AKA as Nielsen Park, Shark Beach is also part of Sydney Harbour National Park. This beach is popular with families and provides sheltered swimming in beautiful surroundings. There is a cafe for snacks and plenty of shade.